The move to Euxton meant that Charlie would now be commuting some 50 miles a day by motorcycle to his job and back in Trafford Park, but he soon found the winter weather a great trial on his motorbike. I prevailed upon him to follow my father’s example and to purchase a 3 wheel Reliant van (this was before the ‘Robin’ car option was introduced). The attraction of the Reliant was that with the reverse gear blocked off it could be driven on a motorbike licence, which was all Charlie had. I should mention that in Charlie’s youth his younger brother Norman acquired a motorbike as did Charlie’s dad, so one must assume Charlie had a motorbike licence from those days. Although Charlie had spent all his life banging on about petrolised transport and cars in particular he could see the sense of the argument, and agreed to follow suit. 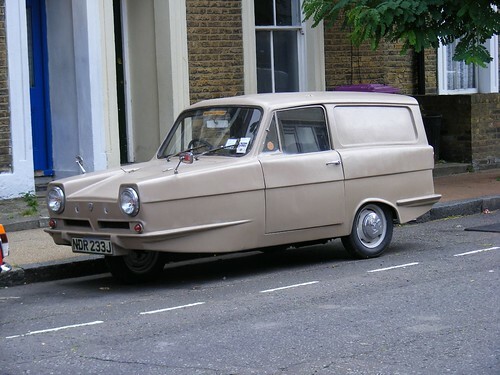 My father and I took him to the local Reliant dealer, fixed him up with a new Reliant van (2/3 weeks delivery) and my father even organised his motor insurance policy for it as he was an insurance agent! Charlie took delivery of his very first motor car in March 1964, at the age of 60.